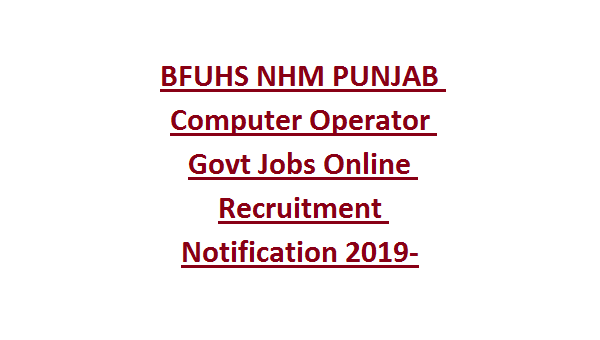 they are eligible to apply online for this BFUHS Computer Operator Jobs of Punjab NHM. Candidates selection will be based on typing test only. Out of 107 posts 14 posts are reserved for ESM (Ex Servicemen). It is mandatory to submit the application form online before the closing date of 12-02-2019. Official website to online form submission for these NHM Punjab recruitment of www.bfuhs.ac.in. 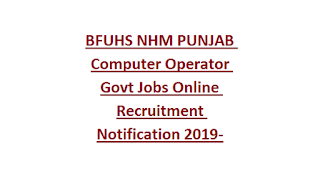 Detailed information about this BFUHS Punjab Computer Operator Recruitment 2019 is updated below. 18-37 years for this BFUHS Recruitment 2019. Degree with 1 years Computers Diploma Course or Any Computers Degree /PG. Must have studied Punjabi till 10th standard level. Must have 30 wpm in Punjabi typing in Raavi Font. Candidates selection will be based on typing test only for this Computer Operator jobs. Candidates must have typing knowledge in Punjabi with 30 wpm. Font for typing test is Raavi font. Candidates can apply online for this Computer Operator posts through official website of www.bfuhs.ac.in. Last date to apply online is 12-02-2019. Typing test date and result details will be available in official website of BFUHS.